Welcome to Issue 9 of SHAPE Journal. 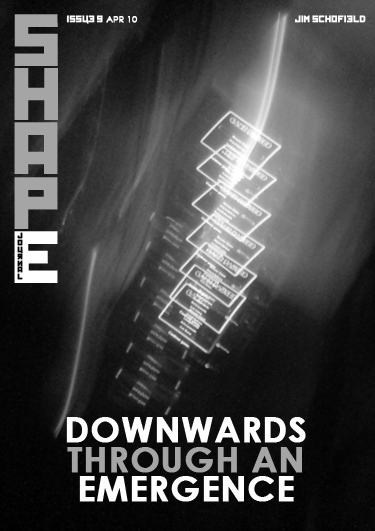 As promised in the last editorial, this issue commences with the first instalment of Downwards Through an Emergence. This is now quite an old paper (2008), and is both quite short and yet highly ambitious. In its decidedly short span, it still attempts to tackle two or three of the main quandaries of modern Science, and even suggests the reasons for them all. You may wonder why I have the cheek to publish such a clearly immature offering, but it was indeed the main impetus to a rush of following papers, which actually began to make some real ground in these areas. This initiator is about Causality and Reductionism, Description and Explanation and even about Pragmatism and Coherence. It could never finish the discussion on any of these topics and contradictions, but it will certainly revive them. I could not leave out this cocky little effort, for it does pose the right questions, and will be followed in the next few issues of this Journal with a series of papers, each of which attempts more serious contributions based on this initial Statement of Intent. In the next few issues there will be papers tackling Mathematical Chaos and its use by mathematical scientists as the answer to many different problems ranging from Turbulence (which it is), to Emergence (which it is NOT). It is not the first time that I have had to address such a position. In Issue 1 (and those following) I wrote about the excuse that the 2008 Bank Crash was to be solely put down to Chaos – “nobody’s fault – you see!”, merely a natural outcome of Nature’s own, unavoidable Chaos, and will, no doubt, have to tackle many other such “explanations” in the future! Here, however, this series does address the problem of revolutionary change versus deterministic Chaos, which is the crux of the alternative solutions to Emergent Change.